This week saw the awarding of the John and Peggy Hayes Canterbury Award for publications on the history of the city, and this year the recipient is Professor David Birmingham for his book Canterbury before the Normans. The 68th International Sachsenymposion is drawing to a close today after four and a half days of guided tours, workshops, poster displays, a public lecture, and academic debate following a plethora of high-quality academic papers on a wide range of early medieval ‘Saxon’ topics. Wednesday saw two events linked to History at Canterbury Christ Church. The first was the presentation of the John and Peggy Hayes Canterbury Award to Paul Bennett as Director of Canterbury Archaeological Trust. 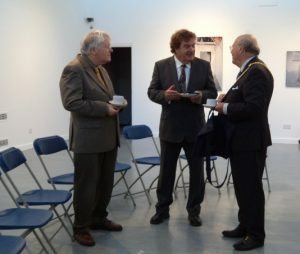 The Lord Mayor, Councillor George Metcalfe, presented the award to the Trust in recognition of the several publications recently completed on such large sites as Canterbury Whitefriars and the outer precincts of St Augustine’s Abbey (now largely covered by the main campus of Christ Church). Among the committee responsible for the Award is Professor Jackie Eales and it was thus appropriate that the presentation took place at the University’s Sidney Cooper Centre. Professor Louise Wilkinson joined Jackie Eales, and other members of the School of Humanities, as well as a number of Trustees from Canterbury Archaeological Trust at the presentation. The audience heard the Lord Mayor congratulate Paul on the continuing work of the Trust in the face of increasing difficulties regarding planning matters and other issues. Paul responded in kind and thanked both the Award’s committee and Councillor Metcalfe. He recalled the activities of John and Peggy Hayes in the field of Canterbury history, and the direct help they had given to the Trust over many decades. Paul also mentioned that 2016 had been very successful, not least the ‘40-year history of the Trust’ exhibition held in the Beaney about six months ago which had brought in several thousand visitors. The second event on Wednesday was Dr Leonie Hicks’ lecture on ‘Reading and Writing the Battle of Hastings, 1066’. As Christ Church’s contribution to the 950th commemoration of a battle that arguably changed the course of national and international history, it was fitting that Dr Keith McLay, the Dean of the Faculty of Arts and Humanities, chaired the lecture. Students joined staff members from the Faculty in the lecture theatre in Old Sessions House, and the audience was considerably enlarged by the presence of members from several local organisations, such as the Friends of Canterbury Archaeological Trust, Canterbury Historical and Archaeological Society, the Historical Association and the University of Kent’s Centre for Medieval and Early Modern Studies. Leonie explored a considerable number of almost contemporary and relatively near contemporary sources, including the poem Carmen de Hastingae Proelio, and narratives of the period and people produced by William of Poitiers, William of Jumieges, and monastic writers such as Eadmer and Orderic Vitalis. As she was keen to point out, there are analytical issues regarding all the sources. Yet some are more problematic than others are in terms of the story told, the level of detail given, and the viewpoint of the narrator. Moreover, when looking at the Anglo-Saxon Chronicle a further consideration has to be its place of production because William’s treatment of the north not surprisingly influenced how chronicles viewed these invaders. Leonie did not confine her analysis to the written word, but also discussed the Bayeux Tapestry. She noted that like Eadmer’s History, this should be seen as a ‘local’ source because Odo Bishop of Bayeux probably commissioned its creation at St Augustine’s Abbey under Abbot Scolland. This makes it especially interesting because she posed the question ‘did the makers have any agency in its design’ at a time when there must have been considerable tension between Anglo-Saxon and Norman in the monastery, as in society more generally. Such topics engaged the attention of the audience and Leonie took a large number of questions after her lecture. Another lecture that drew questions from the audience was Dr Conrad Leyser’s lecture on ‘The Cult of the Blessed Virgin Mary and the History of the Family’ in The Schoolroom of the King’s School on Tuesday evening. Conrad took questions on his analysis of the development of Marian piety during late antiquity and the subsequent Carolingian era, in particular. Several of his questioners were students at King’s, and it was interesting to hear the various viewpoints raised. A considerable number of students from Canterbury Christ Church were at the Friends of Canterbury Archaeological Trust lecture last night. As a result, the lecture theatre in Newton was almost full to hear Peter Clark, Deputy Director of CAT, give a fascinating talk on ‘The Swordsmiths of Holborough: the manufacture, use and disposal of late Bronze Age weaponry’. His assessment of the way bronze swords were made using clay moulds was eye-opening and demonstrated his very careful analysis of all the various processes, as well as opening up a wide range of questions about the availability of raw materials, logistical matters, and the status of smiths and other skilled workers from this period. However, from a personal perspective it was the cultural questions that he posed that reminded me of Everyday Objects, edited by T. Hamling and C. Richardson, and the paradox of an apparently ‘everyday object’ that through its particular use becomes ‘symbolically changed’ or ‘singular’, but that its everydayness is paramount for this process to work. Thus, thematically this was indeed thought provoking for a medievalist who knew nothing of Bronze Age sword making an hour earlier.